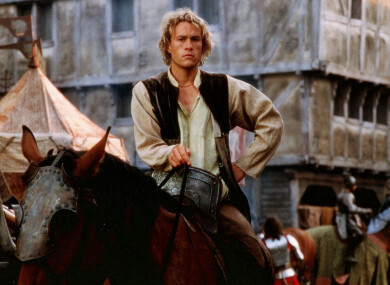 Beach-blonde Heath Ledger is a poverty-stricken squire spies an opportunity to make his dreams come true when his employer dies. He takes his place as a knight, launching himself on the road to riches by competing in jousting tournaments, but his ruse is jeopardised by a dastardly nobleman. RATS OUT. It’s the second night of festivities at the Dome in Tralee as Daithi O’Se interviews the final batch of lovely ladies and the winner is announced. Last night’s installment was largely praised for covering issues like mental health and domestic violence. Tonight, the 32 Roses are all hoping to follow in the footsteps of 2016 victor, Chicago Rose Maggie McEldowney, and win the 59th Rose of Tralee. But is there a prize for best puppet? In 2011, Sally Evans discovered her 21-year-old son Thomas had travelled from the UK to Somalia to join an Islamist terrorist group. Filmed over a pivotal nine-month period, this programme documents the struggle Sally and her youngest son Micheal faced as they tried to reconcile the Thomas they knew with the jihadi-preaching Islamist he became. Yep. Apparently, the man who hosts The Chase and is inconsolable when presented with the words 'Fanny Chmelar', is Doctor Who's next companion. Although the BBC has not officially revealed that they have cast Walsh, a source has told The Mirror that Walsh is "super excited" to be taking on the role. "It means that his schedule over the coming months will be jam-packed so he won’t be able to continue with the full range of programmes he currently makes for ITV." However, the source confirmed that Walsh's role on The Chase would not be compromised. Thanks be to God. If it's true, Walsh will be starring alongside the newly announced doctor Jodie Whittaker, the first female to take up the role in the franchise's history. A Few Good Men (Sky One, 9.00pm) Want the truth? YOU CAN'T HANDLE THE TRUTH! Food Unwrapped Special (Channel 4, 8.00pm) All about 'meat-related innovations' tonight. Delicious. Iceland - A Wild Life (RTÉ 2, 7.00pm) Looking for inspo for your next holiday? Look no further. Celebrity Big Brother: Live Eviction (3e, 9.00pm) Who'll be next to get the boot?